Interpret a probability as a long-run relative frequency of occurrence. Compute the probability of an event when outcomes in the sample space are equally likely. Use basic probability rules, including the complement rule and the addition rule for mutually exclusive events. Use a two-way table or Venn diagram to model a chance process and calculate probabilities involving two events. Use the general addition rule to calculate probabilities. Calculate and interpret conditional probabilities. Use the general multiplication rule to calculate probabilities. 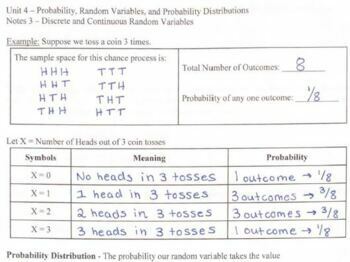 Use tree diagrams to model a chance process and calculate probabilities involving two or more events. Determine whether two events are independent. Carry out a simulation to estimate a probability. Understand and apply counting principles, including permutations and combinations. 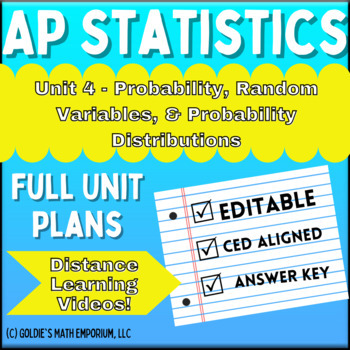 Probability Notes are 22 pages long (total), with an annotated answer key included. Probability Homework Assignments are 19 pages (total), with an annotated answer key included. I give both the word and the pdf versions of the blank notes and homework assignments. I have the pdf version of the answer keys. The Notes are in one document and the homework assignments are in one document.